The 2019 Nitto King of the Hammers Powered by Optima battery is a spectacular off-road battle that combines technical rock crawling with high-speed desert racing. It’s going down all day Friday, which is right now, and the online livestream is free to watch and excellent. The race officially started at 8 a.m. Pacific time, but don’t worry, the broadcast will run well into the night so there is still plenty of action to catch if you tune in right now. You should check it out. You’re probably procrastinating doing actual work anyway, right? The video stream above will show you live coverage of the race itself along with commentary to help you understand what’s happening and who’s winning. To supplement that, you could open the vehicle tracker in another window to see exactly where everybody is on the race course. You can also take a look at the race starting order to see how competitors started the race after qualifying, and check out the rulebook if you really want to dig in. This race is about picking careful lines up ridiculous grades, strategy and even winch operating as much as it’s about flat-out speed. 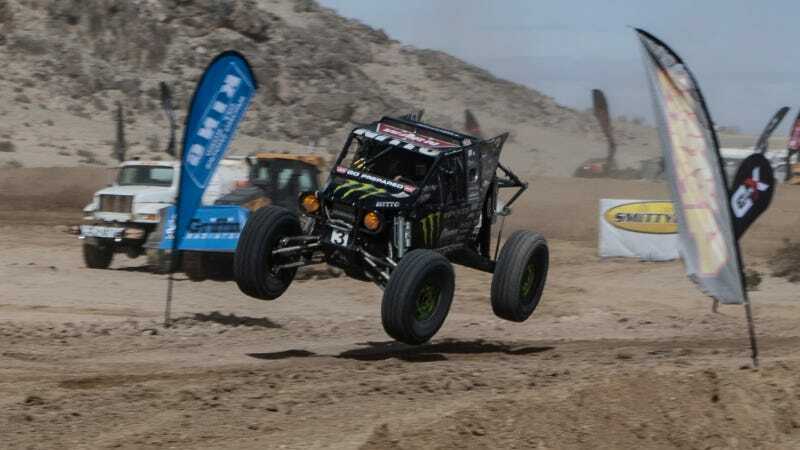 The vehicles competing in this event, Ultra4 cars, are extremely robust four-wheel drive V8 buggies driven by some of the most elite rock-driving athletes in the world. The winner of today’s event gets a $100,000 payout. A King of the Hammers race generally takes between seven and 14 hours for racers to complete, for those who do complete it. If you look at last year’s results, there are a lot more DNFs than finish times.